It never really felt like Ron Smith’s artwork really got the respect I always thought he deserved, even from fellow 2000ad fans, but his recent passing has shown that I wasn’t the only one to rate it highly. I always have. When I was devouring new issues of 2000ad during the comic’s golden period in the early 1980s, Smith’s Dredd was always the best Dredd. 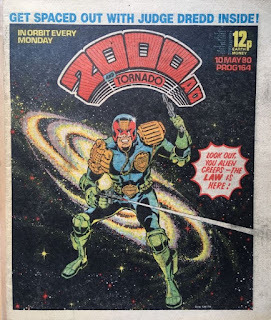 It took me a while to warm to Ezquerra and McMahon - even though they were clearly always working on another level of brilliance - but Smith’s Dredd comics were always so warm and inviting and energetic. His figurework could sometimes be awkward and strange, with human bodies contorted by exaggeration, but when it came to Dredd, the character blazed through Smith’s pages like an American superhero, with bulging muscles and firm-footed posing. But Smith was always one of those artists that I could never be objective about, because I loved it unconditionally from such a young age. Those smooth lines were always so attractive to my unrefined tastes, and probably always will be.